AFC Mapper is a free app and workflow configured within the Trimble Unity platform. It helps water utilities bridge the gap between construction, mapping and maintenance management. 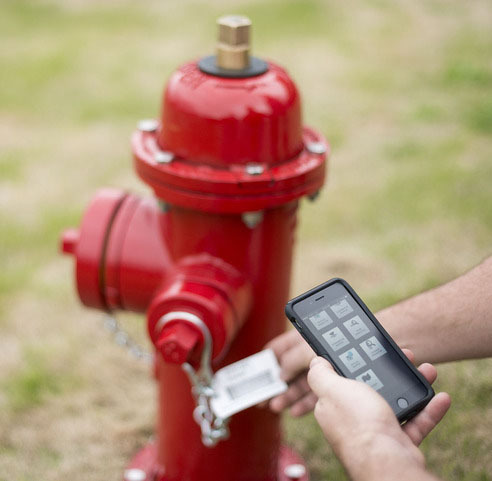 The app is designed to leverage the 2D product barcodes shipped on every AMERICAN Flow Control fire hydrant and gate valve, as well as the power of Trimble Unity and Esri technologies, to automate the mapping and asset management of system fire hydrants, gate valves and related network assets. BYOD Data Collection – Allows a Bring Your Own Device approach to the creation and management of data collection jobs by using the internal camera on your smartphone or tablet. Quick & Simple Data Entry – By scanning the AFC 2D barcodes, the system automatically populates preconfigured AFC fire hydrant and gate valve data collection forms with product manufacturing attributes. GPS Positioning – By using the phone’s or tablet’s internal GPS receiver (if equipped), you can easily capture GPS positions with an expected accuracy of 3+ meters. High Accuracy GPS Support – If greater accuracy is needed, you have the option to use a Trimble external GNSS receiver that can pair with Android and iOS devices via Bluetooth (up to centimeter accuracy). Attach Photos – Capture photos and attach to the AFC hydrant and valve data collection forms. Export Data – Export collected data in various formats including Shapefiles, Microsoft Excel and Esri File Geodatabase. Record information that can’t be determined from ground level, such as precise asset specifications and manufacturing information. Works with any Android or iOS handheld device. Reduce the potential for accidental damage during installation by using detailed product information captured from the barcode. Increased efficiency and productivity in mapping AFC fire hydrants and gate valves during installation by using intelligent and simple data collection workflows and forms. Leverage your investment in tablets or smartphones, Trimble Unity supports various platforms with options for high accuracy GPS data collection (up to centimeter accuracy for GIS). Use photos to memorialize asset location and installation information. This information can be critical in areas of high growth or development, as well as areas that may be susceptible to visual landscape changes due to catastrophic weather events. Can be used on existing fire hydrant and valve installations. Valve or hydrant shall be included with a label or tag, exhibiting a barcode that when scanned by a Trimble mobile device or approved smartphone and necessary software application, the device associates high accuracy GPS coordinates, photos, product description and specifications with the valve or hydrant asset. The application shall provide interoperability with existing ESRI® ArcGIS, computerized maintenance management systems (CMMS), or enterprise resource planning databases.